Under the 1947 State Constitution, the legislature is composed of two houses, the Senate and the General Assembly, with its members elected from 40 districts. One senator and two assembly members represent each district, thus making the Senate a body with 40 total members and the Assembly with 80 members. On average, the 40 districts each comprised 219,797 residents as of the 2010 Census. Senators serve four-year terms, except for the first term of a new decade, which is only two years in order to hold an election as soon as possible in a new district redrawn on the basis of the results of the decennial census. Assembly members are elected to two-year terms. As of June 2017, the Senate was comprised of 24 Democrats and 16 Republicans and the Assembly had 52 Democrats and 28 Republicans. In November 2017, all 80 seats in the Assembly and 40 in the Senate will be up for election. The Legislature may propose an amendment to the New Jersey Constitution. by a three-fifths vote or, alternatively, by a majority vote approved in two consecutive years. In either case,, the amendment must be approved in a referendum by a majority of the voters to be ratified as part of the Constitution. The Senate has the sole authority to confirm or reject gubernatorial nominees for judicial and some executive positions, and by unwritten tradition the senator of the district in which a nominee .resides is normally consulted for approval of nominees and in some cases has exercised "senatorial courtesy" in attempts to prevent the full Senate's vote on nominees. Unlike most state legislatures, many New Jersey legislators also concurrently hold another office at the county or municipal level. Members of each house elects its leaders, typically with the majority party selecting one of its members as leader; in 2015, the Senate President is Democrat Stephen Sweeney and the Assembly Speaker is Democrat Vincent Prieto. The leaders of the Republican minorities in each house are Senate Republican Leader Thomas H. Kean, Jr. and Assembly Leader Jon M. Bramnick. The leaders of the majority in each house have significant power in the selection of the chairs and members of legislative committees; the referral of bills to specific committees for consideration; the scheduling of bills for floor votes; and in providing campaign support to members through their control of fundraising committees. State law allows individual contributions to committees of the legislative leaders of up to $25,000 each year, significantly higher than the limit of $2,600 per election for contributions to individual candidates, thus providing significant political power to the leaders in allocating campaign funds and enhancing their leverage with the members receiving campaign support. The leaders of each house also hire and supervise partisan staff who assist in development of party positions and serve as liaisons to individual committees and legislators. In a report released in September 2015, the New Jersey Election Law Enforcement Commission, the bipartisan agency at which campaigns of legislative candidates must file contribution and spending reports, found that the 2013 legislative elections were the most expensive in state history when not adjusted for inflation with a total of $53.3 million. In accordance with the state Constitution and federal and state court decisions, legislative districts are required to be of substantially equal population. After the results of the federal census conducted each decade are released, the district lines are redrawn by a bi-partisan Apportionment Commission. The Commission consists of ten members appointed in equal numbers by the chairpersons of the state committees of each of the two political parties whose candidates for governor received the largest number of votes at the most recent gubernatorial election. If the commissioners cannot agree on a map, another Commissioner is appointed by the chief justice of the New Jersey Supreme Court to vote to resolve any deadlock. Legislators must live in the districts they represent. Senators must be at least 30 years old and residents of the state for four years prior to election. Assembly members must be at least 21 and state residents for two years. Members of the legislature receive an annual base salary of $49,000 and $110,000 for staff salaries. The Senate President and the Assembly Speaker, in addition to the base $110,000 for staff, receive an additional amount for staff equaling one-third of their salary. All members also receive 12,500 first-class postage stamps, stationery and a telephone card, along with being provided New Jersey state government health insurance and other benefits. Legislators also may collect pension benefits earned from state or local government employment while also receiving compensation for their positions in the legislature. Most legislators maintain offices in their districts, either individually or on a joint basis shared with fellow party members of their district delegation. Service in the legislature is considered to be part-time, and most legislators also hold other public or private employment. The most frequent private sector occupations of legislators are lawyers, teachers and labor union officials. Unlike most states, New Jersey allows legislators to serve concurrently in and receive compensation from other elected offices, such as in positions as county freeholders and sheriffs and as municipal mayors and members of municipal councils and committees. Each legislature is constituted for a term of two years, split into two annual sessions, but with all business from the first year continued into the second year. At the end of the second year, bills which have not received final action must be re-introduced as new bills in the following session. The legislature normally meets twice weekly when in session, with the exception of recesses during the spring while the governor's budget is reviewed by the appropriations committee; during July and August following the approval of the annual appropriations act for the fiscal year beginning July 1; and during election years in the weeks prior to the November election. 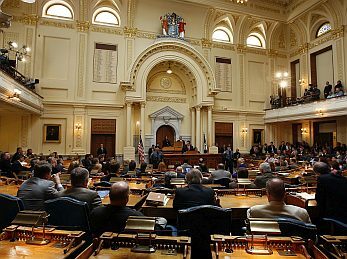 On days of legislative sessions, the majority of legislators commute to and from Trenton, a situation which differs from many states where legislatures meet on consecutive days and members remain overnight in their state capitals. A legislative session day typically begins with committee meetings in the morning, at which bills are considered with testimony by interest group representatives and the public followed by votes taken on possible amendments. A majority vote of the committee releases each bill for a potential vote by the full Senate or Assembly, with the scheduling of the vote generally at the discretion of the Senate President or Assembly Speaker. Bills scheduled for floor votes of each house are referred to as being on "the board" for action. Committee meetings are followed around midday by separate private conferences of each party's members during which the bills scheduled for a vote are discussed to determine whether the party should take a united position. Public sessions with open debate and voting on bills usually commence in the early afternoon; most sessions conclude around dinner time, but on occasion, such as during the controversy over the enactment of the income tax in 1976, sessions may continue through the night. Each house meets separately, except for joint sessions usually held to hear the annual messages of the governor on the chief executive's legislative and budget priorities. The governor also may call the legislature to meet in special session to address specific issues. While both voting sessions and committee meetings are typically held on Mondays and Thursdays, committee meetings and public hearings can be held on any day at the discretion of the committee chair. On occasion, committee meetings are scheduled outside Trenton at locations around the state on significant issues of statewide or regional interest. ﻿Final legislative action is expressed through the passage of a bill, or by adoption of a resolution, which expresses the sentiments or opinions of the members. A joint resolution must pass both Houses and be signed by the Governor. A concurrent resolution must pass both Houses, but is not presented to the Governor. A simple resolution is considered only by the House in which it is proposed. Shortly before the start of the fiscal year beginning on July 1, 2016, Governor Christie signed the annual appropriations act authorizing $33.8 billion in state expenditures, a 3.1% increase over the fiscal 2015 adjusted appropriation. Over 70% of state appropriations are redirected from the state government in the form of state aid to local governments, school districts or in other grants for services to the public. State government operations are funded at $3.5 billion, some 10.3% of total spending. Following the governor's release of the proposed budget, the budget and appropriations legislative committees then take several weeks holding public hearings in which department heads, local officials and members of the public are able to testify supporting or opposing specific items or requesting revisions. The committee then drafts its proposed recommendations with revision to the governor's proposal, in the form of legislation known as the annual appropriations act, for a vote by the General Assembly; if the act is passed by the Assembly, it proceeds to the Senate for consideration. Upon passage by the Senate, the governor may sign the legislation, or "line item" specific appropriations by either vetoing them entirely; reducing them in amount; or revising or deleting language restricting or specifying the use of the funds. The governor is required to certify that the budget as enacted is balanced in that projected revenues are sufficient to meet spending authorized in the act. In addition to the staff hired by individual legislators, the legislature also has additional institutional staff support through the Office of Legislative Services, a non-partisan agency providing legal, fiscal, research, bill-drafting, and administrative services; committee staffing; computer database management; and public information programs and publications. It operates under the jurisdiction of the Legislative Services Commission, a bipartisan body consisting of eight members of each House appointed by the respective presiding officers. Legislative sessions are broadcast live on the legislature's Web site, which also posts a roster with brief biographical information on its members; a legislative calendar of scheduled sessions; statutes; pending bills; a digest of action in each session; and transcripts of public hearings. In addition to official information, private sector media sources regularly monitor legislative actions, including NJ.com; NorthJersey.com; PolitickerNJ.com; PoliticoNJ.com; and NJ105.com. Nonprofit sites providing policy analysis include New Jersey Spotlight and New Jersey Policy Perspective. Broadcast and cable television outlets include NJTV; News12NewJersey and NJ105.com. The national Project Vote Smart site posts information on votes and campaign financing sources for individual New Jersey legislators and Ballotpedia publishes profiles and election data on New Jersey and other states. Other sites tracking developments in state governments and legislatures throughout the country include the National Conference on State Legislatures and the Council of State Governments. The New Jersey Election Law Enforcement Commission oversees the campaign financing of all state and local government elections, and provides online access to reports required to be filed with it by each campaign. The Commission also administers the law requiring candidates for governor and the legislature to publicly disclose their personal finances prior to election day.